In this example we will make a movie with multiple images. 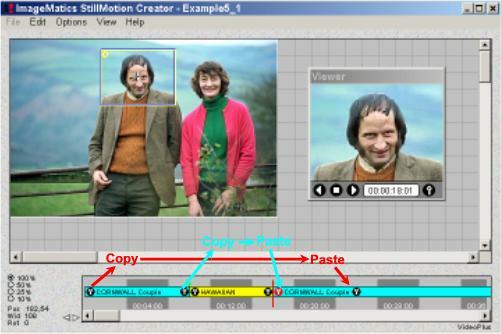 This is a very simple task with The ImageMatics StillMotion Creator™. We will add an image to the movie made at the end of Example 1. We will then do a simple zoom in segment in the movie. Finally we will make a continuous loop by going back to the beginning of the first segment of the first image. The files associated with this example may be downloaded by clicking on the download icon. The files are contained in a self extracting exe so simply click on the downloaded file and the test files and resulting SWF file will be loaded into your selected directory. Click on the Download Icon to download the Example 5 files. Step 1 We begin by loading the Movie (MPX) file that was created and saved in Example 1 Step 4. The Movie file is included in the Example 5 Example download as Example5_1.mpx. Figure 1 shows the the screen after the Movie file has been loaded. Review Example 1 for how the Movie was created. • Note the the Timeline Indicator is at 11 seconds and not sitting on the KeyFrame Marker. 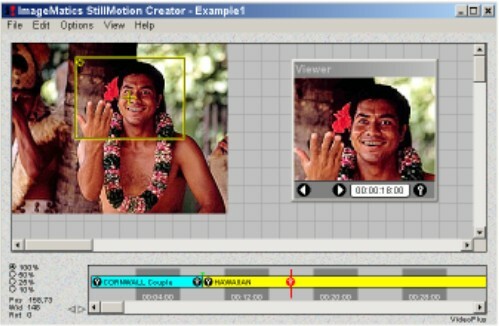 The StillMotion Creator automatically advances the Time cursor one second in anticipation of the next Camera Window move. We must move the time point back to the Key Marker to set up the desired position for the loading of the next Image. Step 2 As addressed in the Note in Step 1 we first move the Timeline Indictor to the KeyFrame Marker of the end of the Movie segment. From the File Menu the Load Picture function is selected. This presents a standard File Box that provides for the selection of the next Image to load. Figure 2 shows the screen immediately after the image file Hawaiian .jpg has been selected and loaded. Step 4 A zoom-in is created at 18 seconds. Play the Movie in the Viewer and you will see the zoom-in on the man's face in the first image. At the 10 second mark the new image will appear and the movie will now do an 8 second zoom into the Hawaiian's face. Step 5 Now we finish the multi-image loop. Using Load Image we load another copy of the Couples picture at the end KeyFrame Marker shown in Step 4 above. To create the loop we now must do two Copy and Pastes. See Example 2 for details on how to do this. Figure 5 shows the Copy and Pastes. First we copy the end KeyFrame Marker from the first segment to the first KeyFrame Marker in the final segment. This copies the Camera Window position as shown in Figure 5 to the start of the segment. We then Copy the start KeyFrame from the first segment, move the 8 seconds on the Timeline and then Paste it. We have now complete the loop. Step 6 Create the Flash Movie as in Example 1 by Selecting the Make Flash SWF Movie entry under the File Menu. See Example 1 Step 4 for details. Figure 6 is the exciting result. We Won't be winning any awards for this one. The hard break between the images is not recommended style. 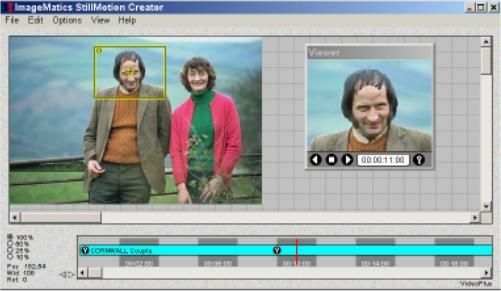 In Example 6 we will add fades between the scene changes and demonstrate how to do a fade to black.